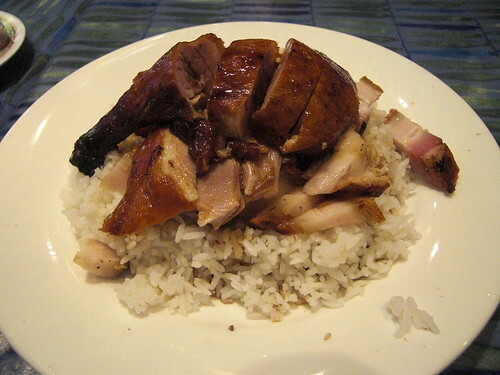 As some of you who follow this blog know, I really like roast duck and crispy pork with rice. A simple dish of cooked meats, sometimes a few leaves of greenery, a little bit of gravy all heaped on mounds of warm, gently steamed rice. If I were ever to find myself on death row (unless my life takes a very big detour, this isn't going to happen) this would rate highly amongst my last requests. Walking towards my latest target, it dawned on me that there are a lot of places selling this dish in Chinatown. In fact, almost every restaurant I walked past sold this dish in one way or another, so I thought I better set some loose ground rules. Well, one really, that the wares must be on full display in the window. It would still mean a lot of places to try, but I don't really mind. I am well up for the gluttony...I mean challenge. Anyway, today's target was Tai Ka Lok. Helen from World Foodie Guide had recently visited with parents and had indicated that it may well be worth a shot, so what the hell, time to tick another one off the rather long list. Located next to the Kowloon bakery, it's pretty much like 90% of the restaurants that you find in Chinatown, slightly grimy, a little rundown with well worn menus containing tippexed prices. As a (crap) Chinaman, I often get addressed in Chinese which results in blank stares from my direction. I think most Chinese waiters cannot fathom that I know no Chinese and continue to talk at me, in the vain hope that some genetic switch will trigger and I will suddenly be able to converse freely with them. No different here, although they cottoned onto this fact pretty quickly with my consistent grunts of "Hurr?" Anyway, the food. This was actually pretty damn good. The duck had a nice crisp skin to it with a thin layer of fat, not quite the flabby example presented to me at Hungs. Flavour wise, bang on the money although it was let down with a poor gravy, no greenery and too many bony pieces. Pork had a great crunch and was everything I would hope for. They even brought me a bowl of broth with stewed bones and some veg in it, nicely lubricating the dish. 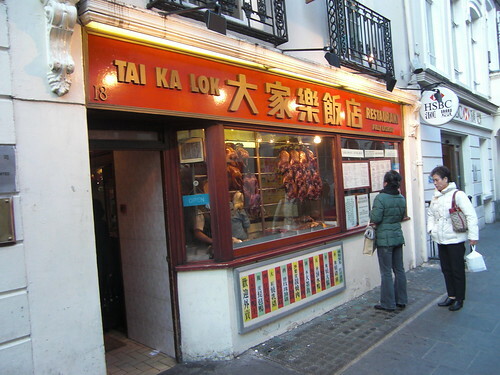 I definitely will take another look at Tai Ka Lok. The duck and pork rice was excellent, although whether it's the winner, well, that remains to be seen. It's certainly up there. Which is your favorite (London) place for this? Take me on your next meaty adventure, please. It's been far, far too long since I had a duck & pork combo. Have walked past this place a couple of times. You're right, the facade isn't really much to look at. Loved my roast pork rice as well. But instead of roast duck, I prefer it with char siew. Tried it at TPT and thought that it was terrible. Will try Ta Ka Lok the next time round. Cheers! I love pork, duck and rice also but sometimes have trouble getting it served to me. At HK Diner I saw it being brought out for people (mostly chinese) and I asked why I couldnt find it on the menu to be told it is a 'staff dinner' Odd. In the end we had to build it up from individual orders which obviously cost more and was also too much. Your comments about not speaking Chinese made me think of my Chinese-American friend, Eugene, who grew up in Michigan with Chinese as his first language. He's super-handsome and waitresses in Chinese restaurants always fawn all over him. UNTIL they hand him the special Chinese menu. And he has to admit that although he can speak Chinese, he can only recognize beef and chicken on the menu. The women always walk away and don't come back! @Mike - I wouldn't stand for it. Just order what you want with rice and it should arrive like that and for no more than £6 or £7. It can normally be ordered like that with standard dishes too, not just roast meats. @Krista - It is an albatross round my neck, not one that will remove itself in the near future. How's your quest going? Where else is on your list? Are you keeping it only to Chinatown? I'd love to hear what you think of Gold Mine (Bayswater) rendition.